Two years ago Chevy trotted out a fierce-looking off-road variant of the Colorado pickup truck called the ZR2. “Sure looks sweet,” we sniffed. “Dare you to build it.” Well this thing just rolled into the LA Auto Show with locking differentials, a diesel engine option, and get a load of that approach angle! As some of you will be quick to point out the Colorado ZR2, even with all this macho farkle hanging off it, is not really a Ford Raptor competitor. That truck is larger, faster and (presumably) more expensive. A more direct comparison could be drawn between this and the Toyota Tacoma TRD Pro, but Chevy has established a bit of a segment of its own by offering a diesel engine with this baby. Beyond the obvious awesomeness of that hood scoop, seriously aggressive front bumper and desert-style bed-mounted full-sized spare the truck apparently has a 2-inch lift over a standard Colorado (and definitely a wider track,) front and rear electronic locking differentials, skid plates and 31-inch tires. I have not seen specifics on ground clearance, approach and departure angles yet which will give us a more empirical measure of how good this truck might be over rough terrain. But the regular Colorado claims about 8.4-inches of clearance, 17.7 degrees approach, 22.6 degrees of departure and 22 degrees of breakover. The ZR2 should be... significantly better. For your context, a Wrangler has about 10.6 inches of clearance, 42.2 degrees of approach, 32.3 degrees departure and 25.8 breakover. That little visual should help remind you why those numbers matter. Meanwhile the ZR2’s shocks were apparently dialed in by an outfit called Multimatic, which works with F1 cars and set up the 2014 Camaro Z/28. This company does a lot more than change valving on shock tubes. It’s an elite dojo of automotive engineering that has done just about everything to do with vehicle dynamics from figuring out how to make humble crossover SUVs quieter inside to giving life to masterpieces like the Aston Martin One-77. Chevrolet’s press release says that this Colorado will be the first off-road application of Multimatic’s Dynamic Suspensions Spool Valve (DSSV) technology. Conceptually, this is pretty much what all shocks do. But more complex designs like the one Chevrolet seems to be employing theoretically helps suspension like this be great off-road without sacrificing as much in on-road stability. The 3.6-liter gas V6 is supposed to be putting down 308 horsepower and 275 lb-ft of torque, with the baby Duramax diesel engine rated at 181 hp and 369 lb-ft. We hear both engine options will run an eight-speed Hydra-Matic 8L45, and all ZR2s will be 4WD with Chevy’s AutoTrac transfer case. ...depending on what you’re trying to drive over. 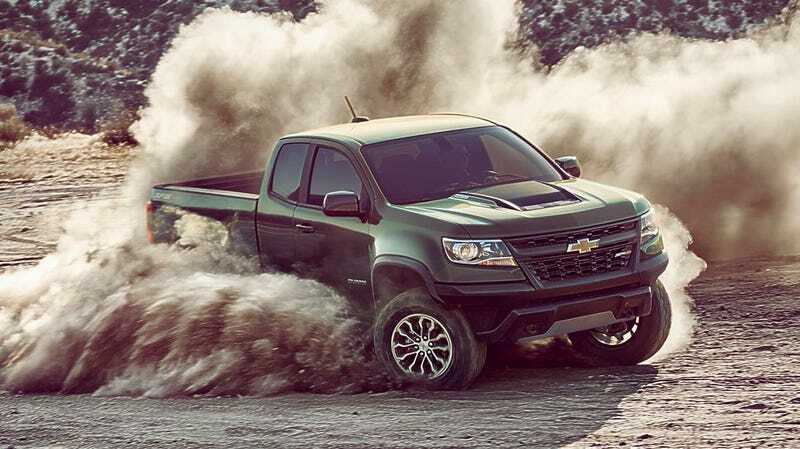 The electronic lockers are supposed to work seamlessly with the truck’s traction control system which also features an “Off-Road Mode” that “alters the throttle progression and shifts calibrations to give the driver better control and responsiveness” according to Chevrolet. The truck will be rated to a 1,100 pound payload capacity and 5,000 pound towing max. Pricing and availability will come out later, and I guess that’s when we’ll find out how good of an alternative this truck really is. But it looks like it will be shipping in extended and full four-door configurations. The short gasoline truck will obviously be the “cheap” option while the four-door diesel will be the top of the range. I’m not sure what Chevrolet is planning on offering in terms of luxury equipment but if I had to guess, and you know I want to, I reckon the cheapest 2017 Colorado ZR2s will ring up in the high-mid $30’s and the most expensive ones will get close to $40,000. In other words– maybe a slight undercut on the Toyota Tacoma TRD Pro and nipping at the heels of the cheapest Raptor. Anyway, the ZR2’s not going to be for bargain shoppers but you’ve got to respect that Chevrolet heeded the call of enthusiasts and actually did the ZR2 concept serious justice. Especially since the “Trail Boss” trim level was such a whimper. With a diesel engine, an advanced 4WD system, locking differentials and what sounds like a really well executed suspension system the ZR2 is shaping up to be an incredible package. Shame the entire cargo bay has to be devoted to carrying a tire, but that front bumper is cool enough to help me forgive almost anything else. 2015 Chevy Colorado: How Does It Really Measure Up?